Common European Cultural Heritage in the Western Balkans – International IRE Conference in cooperation with the appointment of the City of Novi Sad as European Capital of Culture 2021. For the second time, the Institute of the Regions of Europe (IRE) organized, under the direction of former Governor Univ. Prof. Dr. Franz Schausberger, on the 27th of April 2018 a conference on “Cultural heritage – Added value for the Regions” on the occasion of the nomination of the City of Novi Sad (Serbia) as European Capital of Culture 2021. In cooperation with the Central European Initiative (CEI), the City of Novi Sad and the Autonomous Province of Vojvodina, the conference took place in the Regional Parliament of AP Vojvodina, highlighting the great importance of cultural heritage for all European cities and regions, but above all for the candidate countries. Cultural heritage has an important value for all regions, cities, communities and societies. The preservation and salvation of cultural heritage is an important emotional criterion for Serbia’s EU integration, and forms the core for the common European cultural heritage by strengthening its regional identity. “By cultivating our cultural heritage, we can continue to preserve Europe’s cultural diversity”, said IRE-Chairman Franz Schausberger, opening the conference. The former Governor of Salzburg also pointed out that a common European culture can only be achieved if it is based on a specific regional cultural identity. Above all, cultural heritage should be the foundation of a European vision for prosperity. When we talk about cultural heritage, we do not only talk about the past, but also talk about preserving the culture of today and tomorrow. It is about “values of the past that we transfer into the future to preserve the heritage of our culture, including cross-border cooperation and the conditions of cohesion, if these circumstances are not ensured we cannot preserve the cultural heritage”, said the President of the Regional Parliament of AP Vojvodina, István Pásztor, in his speech. In addition, he emphasized the diversity of cultural heritage as it encompasses various territories, multiculturalism and inherited culture. The ability to understand a common interest, regardless of political directions, should be at the center of the daily process of perception. This is an example of the city of Novi Sad’s claim to be a pioneer when it comes to carefully and actively shaping its future. In Serbia, and especially in the city of Novi Sad, many ethnic groups live in harmony. Dalibor Rožić (Member of the City Council for Culture) emphasized at the conference that Novi Sad also promotes “universal, lasting and shared values”. The Novi Sad Cultural Administration supports projects of national minorities aimed at preserving their traditions and cultures, while promoting initiatives for the recognition and emphasis of the common. Another perspective was given by Dragana Milošević (Provincial Secretary for Culture, Public Information and relations with Religious Communities of the Autonomous Province of Vojvodina) in her speech, when she stressed the interconnectedness of cultures that influence the regions and thus the cultural heritage itself. Fortresses, monuments, folklore and archeology are examples that show the different aspects of history. For Paul-Henri Presset, Head of Information, Communication and Press, Delegation of the European Union to the Republic of Serbia, the main focus lies on citizens: “Making them aware of their own national identity a key to the EU accession process. Providing them with greater opportunities for their own future is the foundation of sustainable prevention”. Cross-border and regional cooperation within Serbia and with the EU are important in preserving cultural heritage for generations to come. The EU supports cultural heritage and social cohesion in Serbia. Regarding regional policy and social cohesion, Johannes Irschick, Director of the Austrian Cultural Forum of the Austrian Embassy in Belgrade, focuses on joint regional projects for the preservation and promotion of regional cultural heritage. “It cannot only foster our mutual understanding of supraregional heritage, but also local and tourism development and to initiate regional projects requires common strategies and funding mechanisms”, said the director. Cultural heritage contributes to promoting social cohesion across Europe and provides a framework for participation, engagement, promotion of integration and cooperation. In the opening speech of the Panel “Best Practice Examples of Cultural Heritage Protection and its Financing”, Norbert Beckmann-Dierkes (Head of the Konrad Adenauer Foundation for Serbia and Montenegro in Belgrade) spoke about the current situation of the Western Balkan countries “which are on the right track to the EU, for example by investing in cultural goods. Together, a cultural city can be built and Novi Sad represents such a city”. However, in order to be part of the cultural path to the EU, the cultural asset “is economically, politically and socially important, which transcends borders, nationalities and regions”, said Asja Drača Muntean (Representative of Serbia to the Enlarged Partial Agreement on Cultural Routes of the Council of Europe of Ministry of Culture and Information in Belgrade). In her opinion, a step towards the EU would be to start with small programs to gain experience. 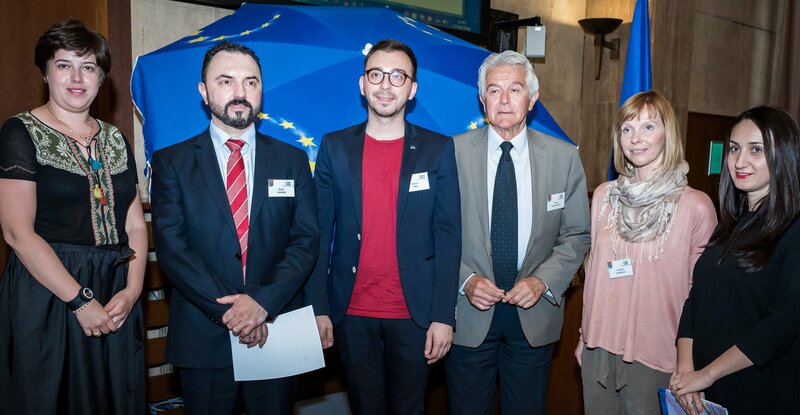 Additionally, Ketrina Çabiri Mijo, Head of the project “Network Creation and Promotion of Castles” in Albania, highlighted the importance of sustainable and above all stable projects. “In Albania, cultural goods are not limited to castles, but are extended to f.e. churches”. For this reason, a common understanding of what culture means should be developed. Boran Ivanoski (NALAS program officer for the Sustainable Tourism Task Force in Skopje, Macedonia) goes one step further, stressing that “good cooperation at local and regional government level is important to promote, among other things, tourism. Above all, this would bring social, economic and environmental effects”, says Ivanoski. For this purpose, NALAS offers position papers on concrete measures and recommendations for sustainable development. For Adrian Tibu, Director of the Municipal Theater “Gong” in the City of Sibiu in Romania, is the key to success “the attitude to be ready to be part of the EU”. The combination of culture and tourism would lead to benefits and opportunities, innovative programs and services are inevitable tools to make the cultural heritage accessible to citizens and visitors towards Europe. There are still daily cultural events and volunteer programs are taken place in the city of Sibiu in the framework of the Capital of Culture. In Europe, the wealth of historical buildings and sites, historical neighborhoods and cultural landscapes is visible to the people. For Katarina Živanović (Archaeologist Europanostra Serbia) “cultural heritage provides European countries and regions with a unique identity, a basis for developing cultural tourism and attracting investment”. To sum up, cultural heritage is a key component and contributes to the attractiveness of European regions and cities. In this way, it creates jobs and attracts talent, companies and investors. In the panel discussion “Regional Cultural Heritage – A European Vision for Prosperity”, Nemanja Milenković, Director of the Foundation Novi Sad (FNS20201), emphasized in his keynote that cultural heritage goes beyond the national framework. It was inherited from the ancestors, represents a way of life and shapes regions and cities. “Social development therefore influences what we understand by cultural heritage”, says Milenković. Cultural Heritage will be celebrated throughout the year 2018 with various events and activities aimed at strengthening the common European identity and providing new impetus for the development of social and economic sectors throughout Europe. “In order to develop the cultural heritage of nations in the long term, it must be protected in the case of threatening situations, so many state and non-governmental organizations are actively involved in the process of cultural heritage protection”, Leylya Strobl (Board Member of the Austrian Blue Shield Committee, Austrian Roerich Society)further explained in her speech. The exchange of ideas and innovations for sustainable development, based on the international concept of human rights, is essential for the protection of cultural heritage. The aim is therefore to raise awareness of cultural heritage in civil society. “Only governments alone cannot handle this task”, explained Strobl. The UNESCO-affiliated NGO “Blue Shield International” is an internationally recognized organization operating in 28 countries and working to protect cultural assets. Tijana Palkovljević Bugarski, Director of the Matica Srpska Gallery in Novi Sad, pointed to the question of a “national culture”. The gallery not only illustrates Serbian art, but also deals with the processes of protection of Serbian cultural heritage in the region, especially in Hungary and Romania. “We need not only national identity or culture, but also the embedding in European culture, a broader view of Serbian cultural heritage in the European context, because cultural heritage knows no borders”, expressed Bugarski. She also pointed out that these projects for the protection and prevention of secular and religious Serbian art, cooperation between Serbian, Hungarian and Romanian cultural institutions, develop and promote cultural diversity in the region. Another example was provided by Marija Budimir (Head of Tourism and Culture in the Vukovar Srijem in Croatia), stressing the importance of intangible heritage, such as cultural festivals that to preserve the cultural goods. Tomislav Paljak, Vice-President of the Varaždin County in Croatia, emphasized the common history in this context and referred to the closeness between Novi Sad and Varaždin. The decay of cultural heritage is an “inefficient way of dealing with culture. To revitalize a region, there is a need for skilled workers”, highlighted the Vice-President. EU projects would contribute to the preservation of cultural assets. Financing transnational projects is important for both cities and regions. “In order to promote prosperity and preserve the cultural heritage for future generations, the EU supports various projects related to this theme with the most important programs for Serbia being the Creative Europe Program and the Instrument for Pre-accession Assistance (IPA) ‘Creative Europe’ funds projects around the European Year of Cultural Heritage 2018 in the regions, enabling the revitalization of objects and the purchase of equipment that can stimulate culture development and progress”, stated Mina Radmilovic Pjevac (Antenna Creative Europe Culture Desk Serbia, European Affairs Fund of AP Vojvodina). According to Dimitrije Tadić, Head of the Creative Europe Culture Desk in Serbia, an intensive exchange of sustainable concepts, not only at national but also at regional level, is necessary for cooperation with the EU. “Priorities and objectives are needed to fund sustainable projects, so a detailed regional and state-level exchange is the first step”, explained Tadić. To create awareness, one must preserve the value of the past. The origin of the cultural heritage is that a modern person must determine themselves in relation to their own past. “It is the past whose cultural value is recognized in the present. The existence of the common heritage therefore always includes the recognition of common values. On the one hand, taking care of these values while cultivating all layers of testimony about the common past can lead to social well-being. On the other hand, indifference certainly leads to social disorientation”, concluded Milan Popadić (UNESCO Chair in Cultural Policy and Management, University of Belgrade). To create awareness, one must preserve the value of the past. The origin of the cultural heritage is that a modern person must determine themselves in relation to their own past. “This is the past whose cultural value is acknowledged in the present, so the existence of the common heritage always involves the recognition of common values, and caring for those values while cultivating all layers of testimony on the common past can become social Prosperity on the other hand, indifference certainly leads to social disorientation”. The Institute of the Regions of Europe (IRE) has been dedicated to strengthening regions and cities throughout Europe for around 15 years. The aim of the conference was to present best practice examples of the preservation of cultural heritage in various European regions, especially in Central, Eastern and Southeastern Europe, in order to exchange experiences and knowledge for the preservation of cultural assets. Experts and politicians from all over Europe attended the conference to discuss innovative financing mechanisms as well as sustainable approaches to regional and local cultural heritage conservation activities. 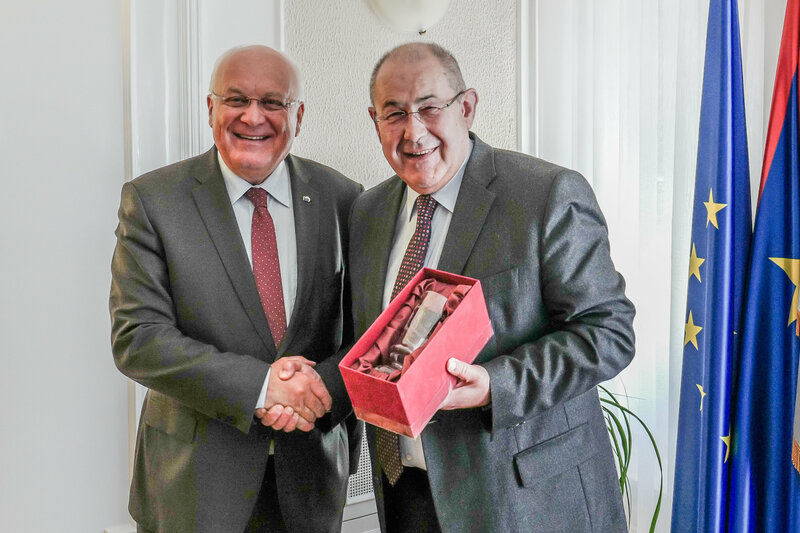 IRE-Chairman Franz Schausberger has held bilateral talks with, among others, the President of the Autonomous Province of Vojvodina, Ištvan Pásztor, on the European Commission’s recent progress report on Serbia and on the EU’s Western Balkans Enlargement Strategy. The importance of preserving the cultural heritage, which is a cornerstone of the European Union, was emphasized. Around 120 participants from eight European countries participated in the international conference in Serbia. Conference partners in Novi Sad were the Konrad Adenauer Foundation Serbia, Europa Nostra, Blue Shield International, Raiffeisenbank International AG (Serbia), the Council of Europe, European Institute of Cultural Routes and the Federal Ministry for Europe, Integration and Foreign Affairs (BMEIA).